Marston Impresses On Debut – Stops Roman In First Round! 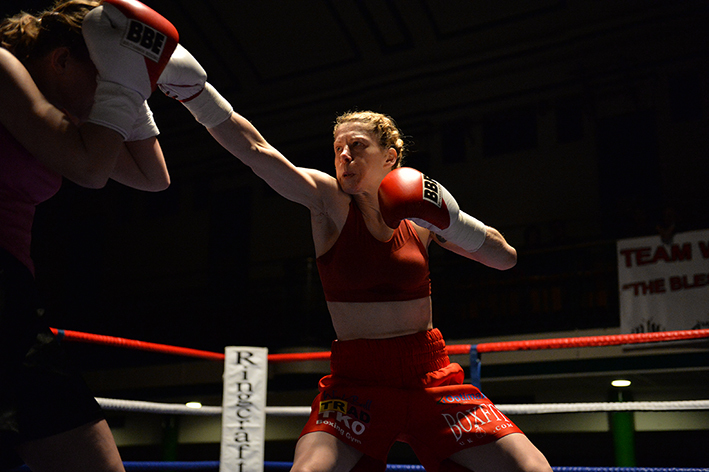 Marianne Marston, the exciting protégé of legendary Heavyweight Champion of the World Smokin’ Joe Frazier and two time IBF Cruiserweight Champion of the World Steve ‘USS’ Cunningham, made an impressive start to her long awaited professional career at York Hall in Bethnal Green, London, on Saturday night. Marianne, who was discovered and trained by the aforementioned Smokin’ Joe, until his landmark North Philadelphia gym closed in 2008, has had a succession of false starts to her career over the past few years, was clearly fired up for the fight against Hungarian Gabriella Roman. Following an entertaining ring walk, which included Marianne shadow boxing until her entry track reached a crescendo, after which she began her entry in style, dancing and banging gloves with her many admirers that lined the route. On entering the ring Marianne once more showed her appreciation to the highly vocal and appreciative crowd, before turning to her own legion of fans, many wearing ‘Team Golden Girl’ t-shirts, which set of a cacophony of cheers that resonated throughout the famous home of British boxing. Her ring entry must have taken close to four minutes, well over twice as long as the actual fight itself lasted. Right from the opening bell Marianne went hard on the attack, with a mix of solid jabs and double handed flurries, within a matter of seconds Roman was sent to the canvas for the first time. It could only have been thirty seconds later that the Hungarian girl was back on the canvas, this time following Marianne backing her into her corner and letting rip with big looping right hands followed by wickedly vicious lefts to the head. The instant referee Ken Curtis finished the count, Marianne went back on the attack in similar vein, this time though Roman couldn’t keep her guard up, which allowed Marianne to pick her off with a barrage of massive left and rights, until the aforementioned Ken Curtis stepped in to save Roman further punishment, after just one minute and forty seven seconds of the first round. Speaking earlier today Marianne spoke briefly on her sensational maiden victory. “I’m ecstatic that I won, it wasn’t my intention to stop Gabriella, I just fought the way Joe (Smokin’ Joe Frazier), Marvis (Frazier) and Val (Colbert) drilled into me all those years ago. I suppose really I would have liked to have put a few rounds under my belt just for the experience, but at the end of the day the win is the important thing, especially as I dedicated the victory to Joe. If it wasn’t for Joe’ stotal belief in me, I am sure I would have given up on my dream after all the setbacks of the past few years. I only wish he was still with us, healways said he would be there at my first fight, he may not have been there in person for obvious reasons, but I believe he was there in spirit. I’m also dedicating the win to Rio (Gianluca Di Caro), he above all others encouraged and supported me through all the ups and downs of the past few years. He is my rock, he never waivered in his support or encouragement, no matter what. I would also like to say a huge thanks to my coach Barry Smith at the TRAD TKO Gym in Canning Town, he’s a great coach, really is one of the best around, he never tried to change my style, from that Joe had instilled, just built from it to make me a more rounded fighter. I also have to give a massive thanks to my sponsors, Optimax, Winkball and BoxFit, they have stood by me since 2010 and I’m so pleased to finally carry their name into action. I mustn’t forget tothank Dave Murphy and Bruce Baker, for giving me the chance to fight on their show, and finally I’d like to thank Gabriella Roman for taking the fight at such short notice.